If the Criterium Course was hard, then the Cross Country course was brutal. The women had to do three laps and the men five, of a course that challenged even the Commonwealth Games athletes at the front of the field. Starting again on the top of Fore Down, we raced a fast section through the grass area on the top before quickly hitting a section of single track, where inevitably the riders became spread out as we rode single-file through the technical lines in the top part of the course. It was then time to drop...we descended VERY quickly down the side of the down, on an off-camber grass track, building up enough speed that you had to be very careful not to over-cook it, and end up on the barbed wire fence as you made the swift right-hander at the bottom. Your momentum then carried you onto a difficult section of grass terraces that demanded constant concentration to avoid losing the back-end and crunching your rear derailleur on the terraces if you dropped off them (this happened to one of the top Guernsey boys). At the end of the terraces you were then forced to pop the chain down into the little "granny" ring on the front, because as you made the hairpin turn to start your ascent of the hill you were confronted with a very steep section through the trees. This caused problems for me twice; as the chain dropped off the inside ring and I had to dismount to get it back on. The ascent took you up through a great section of wooded single-track and back up onto the top of the downs: lungs burning and legs aching. The second descent was equally as fast as the first, skirting the field that borders the Bowcombe Road; the grassy track allowed me to max-out my gears, which must have meant I was doing close to 40mph down there! (good job the St. Johns guys were standing by as you rounded a sharp left hander at the bottom into Cheverton Farm - I know my back end was skittering about quite a bit on the dry, loose flints. Out of the farmyard you had a flat section that posed as a good place to take on some energy gels and a bit of liquid before you hit 'THE WOODS'! When I tried to ride this section a few weeks back it was completely unridable in places because of the rainfall we had been enduring. But with a good bit of sun and plenty of riders compacting the trail down over practice laps in the last week, 'The Woods' had become a fantastic section of the course; challenging, but great fun to ride. With a bit of luck the farmer is hoping that we can keep this section of the course permanently open for local riders! After emerging from the woods into Cheverton Quarry it was a vicious ascent back up onto the top of the down, with some incredibly steep and technical sections towards the top, which certainly pushed the exhausted riders. The lap didn't end there though, we had "The Drop" to navigate - a very steep, rock strewn descent that needed every ounce of concentration to just stay on the bike. To make things worse, at the bottom you had to skid round into the "Bomb Hole" (which was included in Crit race). After that it was then back up to the top of the course, and what after 5 gruelling laps would be the finish line! Once again, my start was pretty poor, and I ended up clinging onto the back of the front group as we entered the first section of singletrack; soon we were spread out as a result of the single-file riding and those on the front once again had a slingshot into an early lead while I was still stuck in the single track. One thing that I'll definitely be working on this year is my starts! After the rapid descent I was picking riders off on the uphill section, until I had a chain drop incident and lost a few places. I made those up again on the flat section before we hit the woods, but then lost them again due to poor riding on a few of the technical uphill sections in the trees. I wasn't sure what was going on, I had ridden "The Woods" numerous times and had been fine, I put it down to first lap nerves and tried to calm the frustration. I regained the lost places on the final uphill of the first lap and continued to hold a place among a couple of Jersey riders and a Menorcan. On the second lap we dropped one of the two Jersey riders, I had another mechanical; dropping the chain in the woods, only a minor one, but it called for a bit of a burst to catch up with the two others. At the top of the second climb the Jersey rider punctured and had to change his bike - some of the guys had taken the risky decision to run very lightweight tyres, and with all the bracken, broken clay pigeons and flints everywhere there were a couple of puncture victims; luckily I was running heavy duty tyres; a bit more weight to lug around, but at least I didn't flat! On the fourth lap the Menorcan escaped; in fact he caught and overtook my team mate Sean Williams who was the next rider in front of us; he must have had some rocket fuel energy gel or something! His luck didn't last long though, as he too became a puncture victim; another guy running thin tyres at very low pressure apparently! On the final lap I was making up significant ground on Sean and could see him in front of me on the longer sections of the course. I then had an unfriendly encounter with a tree in 'The Woods' and lost some valuable time - nothing damaged, just a bit bruised. Sean was still in sight on the final climb, but there was little motivation to put a huge effort in to overtake a team-mate; especially the team manager! So I just hung on to the finish, eventually rolling across about a minute behind Sean; both of us a long way in front of the next rider back. Sean took 12th and I came in 13th, a major improvement on Monday's result for me! It was an incredibly hard race, but a fantastic course and there was some amazing support from local families and team members alike. I'm not sure people realise how much we appreciate the support as we roll past in a zombie like state of pain; but it really does make a huge difference, so a massive thanks to all who came along! It seems crazy that the Games are all over now, so much has been leading up to these races, and they haven't failed to disappoint in terms of challenges and competition. I knew it was going to be tough - it was! I knew the team would do a fantastic job at organising it all and they did. 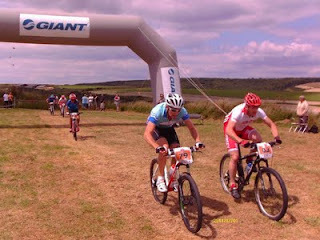 I'll write another blog in the next few days about what my hopes are for the future; at 20, I was the youngest competing in the mountain biking by about 6 years I reckon, so hopefully there will be some great events to come for me, including I hope a few more Island Games...Bermuda 2013? That would be amazing!